Sara Dittrich is an interdisciplinary artist living and working primarily in Baltimore, Maryland USA. 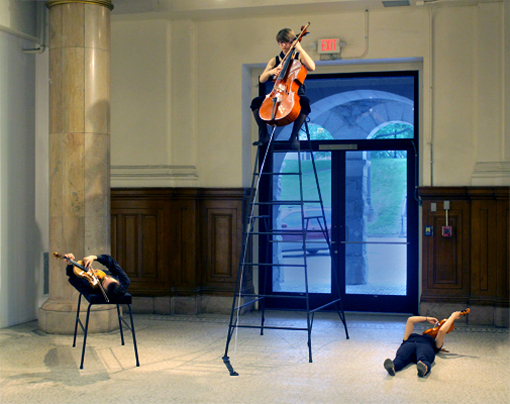 She creates objects, installations, and performances using the forms of musical instruments and interactive technologies to investigate the dynamic acts of listening, communicating and moving. She received her BFA in interdisciplinary sculpture from the Maryland Institute College of Art (MICA), and has exhibited her work in numerous shows across the East Coast from New York City, to Atlanta. She has also exhibited her work internationally in the Czech Republic where she studied at the Academy of Arts, Architecture and Design in Prague with the sculpture studio headed by Dominik Lang. She was awarded the 2013 Beers Contemporary Award for Emerging Art and has recently been accepted to Sculpture Space and the Vermont Studio Center residency programs.